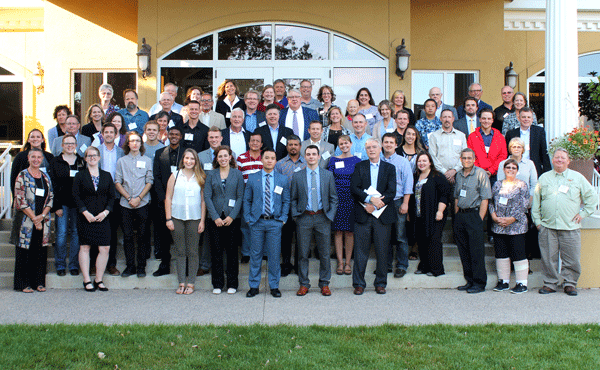 On Tuesday, September 20, Southern Minnesota Initiative Foundation (SMIF) convened more than 100 southern Minnesota business leaders at The Entrepreneurial Bridge conference at the Historic Hormel Home in Austin. The goal of this event was to foster connections between high-potential companies. With over 60 companies attending what was a full-day of panels, keynote speakers and networking periods, many new connections were sparked and existing ones deepened. "Those in this room represent the future of Minnesota," opened SMIF President and CEO Tim Penny. "The goal of the Entrepreneurial Bridge is to leave all of the business leaders in this room, whether a startup or Fortune 500 company, with new resources, a new perspective and a bigger network. You have the power to leave a lasting legacy for your community." The day opened with an inspiring message from keynote speaker and best-selling author Ross Bernstein, originally from Fairmont. "To be a champion, it means doing the little things the right way," Bernstein told the group. "The biggest indicator of your success is the quality of your relationships." Over the course of the day, four panels of experts spoke on topics including scaling your business, taking advantage of challenges, preparing for a changing workforce and the importance of a disaster recovery plan. In addition to Ross Bernstein, the group also heard from Pete Speranza of 301INC about how General Mills is innovating to keep up with the rapidly changing food landscape and why companies need to be able to pivot. Another component of The Entrepreneurial Bridge was a student business competition. Seven student groups representing four schools - Gustavus Adolphus College (St. Peter), Minnesota State University, Mankato (MSU), St. Mary's University (Winona), and St. Olaf College (Northfield) - presented their business plans to SMIF's Leadership Circle. Fishing Charters and Resorts (Gustavus) and Maji Fish Pond Kit (St. Olaf) were selected as the winners of the two $5,000 prizes. This event was generously sponsored by Rosen's Diversified Inc. (RDI) in Fairmont and The Hormel Foundation in Austin. "Rosen's Diversified started with my dad and uncle when they came back from the war and started buying livestock," said Tom Rosen, CEO of Rosen's Diversified. "It now has over $4 billion in assets and more than 4,600 employees. If you look around this region, these companies are homegrown, which is why I think events like this are so fun." In the last keynote of the day, Gary Ray, Board Chair of The Hormel Foundation, asked all those in attendance to reflect on why their work is important to the region. "Passion is necessary and fine, but in itself, is not enough. Building a company that leaves a lasting impact on the community, that is the 'why?' worth doing." Southern Minnesota Initiative Foundation (SMIF), a donor-supported foundation, invests for economic growth in 20 Minnesota counties. The Foundation has provided more than $100 million in grants, loans and programming within the region during the past 30 years. SMIF's key interests include early childhood and economic development. To learn more about our work and mission call 507-455-3215 or visit www.smifoundation.org.